Present guests with hot coffee, tea, or cocoa with this Pro Line electric kettle from KitchenAid. Its frosted pearl finish and attractive design will blend in with virtually an atmosphere. 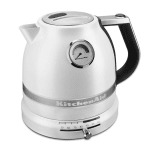 Its simple but elegant design and quick, efficient heating will make this 1.5 liter kettle an instant go-to piece. "I like the beautiness of it how the temperature is controlled and also less time to heat up bravo my kitchen is looking good with its beauty huuu..."
"This kettle is wonderful! It heats water to various perfect temps for tea and noodles. Ordering from Katom was super easy, and the shipping didn'..."
"I like the beautiness of it how the temperature is controlled and also less time to heat up bravo my kitchen is looking good with its beauty huuuuu I love it"
"This kettle is wonderful! It heats water to various perfect temps for tea and noodles. Ordering from Katom was super easy, and the shipping didn't take that long. This is a lovely looking kettle too! There is just something special about the Pro Line series! :)"